The Riverbend Research Highlight Series (RRHS) provides a forum for graduate and undergraduate researchers in the University of Georgia's Riverbend Research Laboraties to share exciting research highlights with their colleagues. These accessible, high-level presentations encourage cross-disciplinary communication and promote awareness of the UGA College of Engineering's diverse programs. The Riverbend Research Highlight Series features research seminars spanning a broad range of areas, including biomedical devices, tumor cells, analysis of global plastic waste, photo-bioelectrochemistry of cyanobacteria, characterization of lipid bilayers, aerosol science, and combustion science. 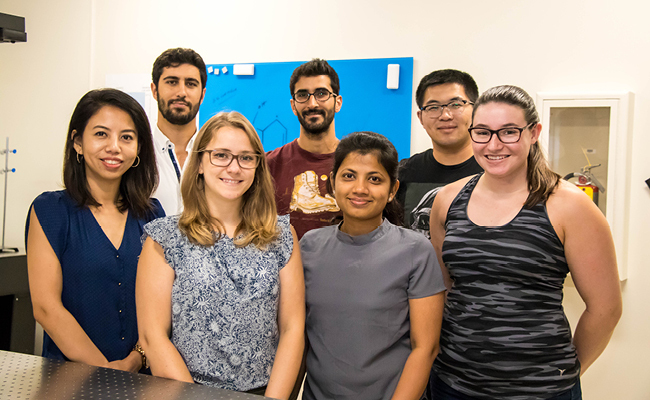 The speakers for the 2018 RRHS are (front row, left to right) Priya Singha, Amy Brooks, Baviththira Suganthan, Alanna Koritzke, (back row, left to right) Elio Challita, Kai Atwi, and Yang Liu. "Combustion Chemistry of Advanced Biofuels"
"An Evaluation of the Global Trade of Plastic Waste and Impacts of the New Chinese Import Ban"
"Novel Micro-Membranes Electrodes for the Rapid Characterization of Lipid Bilayers"